Also Available in a both side printed version. 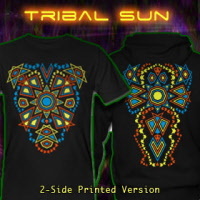 "Tribal-Sun" UV re-active neon color printed shirts, tops and hoodies. Three color neon flex print, or two neon colors combined with a metalic silver motif are available for men and women in many different models and color combinations.